Year after year, on opening day of camp, we see parents take on that far-off look and reminisce out loud about their own summer camp days. 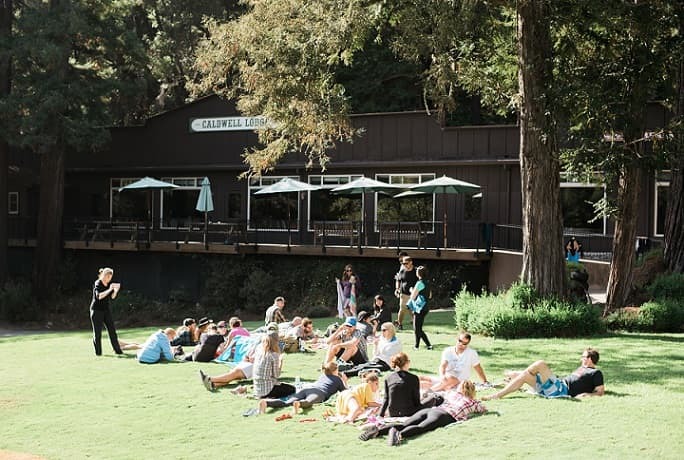 They remember the friendships and the traditions that connected them to the camp family comprising many generations of kids (grown-ups now, too) from all over the Bay Area. These parents talk about that camp family spirit from a distance, but we are committed to carrying on that spirit every day here, with each new group and each new generation of campers. Age-old traditions are still very much a part of our culture, and it doesn’t have to stay in the past—for anyone. In fact, merging the power of camp traditions with your family’s own may be the doorway to some of your best family gatherings yet. Why not host your next family reunion or birthday party at Kennolyn, inspiring all the children-at-heart to come out and play just like in all of their far-off memories? Revive the campfire tradition. Kick off your stay with a campfire in the redwood amphitheater. Roast marshmallows for s’mores under the stars and sing those favorite family songs, passing some of the older ones down to the newer generation. Share family memories in our forest retreat. We can set up a projector screen on the amphitheater stage. While everyone sits on the rustic log benches, you can show old home movies and photos that you’ve collected leading up to the reunion. Invite family members up to the front of the group to share stories—recent stories to fill in the time since the last gathering and older stories that remember family members who are no longer with you. Hold an annual tournament or other games for all ages. Each family shares unique interests, and our 300 acres offer the perfect backdrop for a huge variety of activities. One of our Kennolyn families is spread throughout the Bay Area, the Northwest, and even the East Coast. They gather here every year and gear up for their big kickball tournament for all ages. As competitive as they can get, the incredible team spirit is much more inclusive than Green versus Yellow. Another family comes every few years for the Turner Family Olympics on our high ropes course in the redwoods. Rather than choosing a winning team, they celebrate family members for personal bests and team spirit. You can also hold a pool party, an outdoor barbeque, a scavenger hunt, and ping pong, archery, or volleyball tournaments. Family reunions don’t necessarily happen every year, but the excitement and buildup between events make them even richer, especially when you have an immersive family retreat to look forward to. Carve out some time in your party for formal congratulations for the guest of honor. But before you really get into the planning, ask them directly how they want to be celebrated, showing that you value their opinions and wishes—especially as they are developing stronger relationships with themselves and the world around them. Participate in meaningful rituals. One great way to show your heartfelt support is for the whole family to form a circle, holding hands, around the individual. At camp, we make use of the circle often to include everyone equally. Let everyone take a turn to share something they are proud of about the guest of honor. The honoree at the center might then take a turn to thank each individual around the circle for something that person has added to their journey. Welcome your young adult into greater responsibilities. We usher older campers into guiding and mentoring roles for the generations after them in our leadership training programs, and you can do the same for them in the context of your family. One great way to represent this evolution is to hold a symbolic passing of the torch ceremony, where all the adults stand behind the guest of honor and an older sibling, parent, or other adult representative hands them a lit candle or torch and acknowledges the responsibilities this young adult is now ready for. Summer camp is like a regular rite of passage from one year into the next, and it’s the perfect setting for the whole family to celebrate another symbolic milestone of your young adult’s growth. Express love and gratitude with flowers. Spring in the Bay Area brings so many new beginnings in the wake of our winter rains, and Kennolyn’s venues put you right in the middle of all that fresh growth. Bring a very large empty vase to set up on a centrally located table at your celebration. Ask everyone to bring a small bunch of flowers that remind them of the mothers and fathers you’re celebrating. Once everyone is gathered, let each person or each family group take a turn to add their flowers to the vase and share the connections they felt with those flowers. Be sure to take pictures with everyone in front of that full vase, with the guests of honor front and center. Return the mothers’ and fathers’ generosity. Let the younger family members take responsibility for some of the organizing and entertaining to really show their appreciation of their parents and grandparents. The older kids and young adults could take on leadership roles, getting the younger kids involved. They might put on skits, as we often do at summer camp, or show off other talents. Here at Kennolyn, our coordinators and staff are always fully involved in the setup, service, and breakdown of your event, so you can relax knowing that the necessary elements will be covered as you let go and enjoy being a guest of honor. At camp, kids don’t just hear about traditions—they experience them and they help to strengthen them firsthand. Just as the camp family needs consistent care and energy to stay bright and resilient, so does your family. We’re always evolving individually and collectively, and we need opportunities to stay connected and nurture those changing relationships. Traditions serve as wonderful containers for that living evolution, and they are worth celebrating! Come celebrate with us at Kennolyn where tradition is our natural way of being. There is no limit to the types of events we can create together, so get in touch and we’ll start planning.